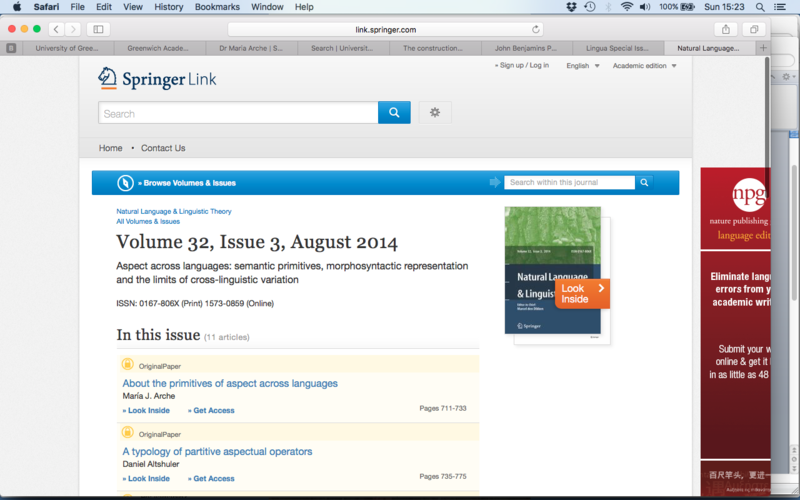 The Topic/Comment issue addresses the encoding of aspectual information in the syntax and mor- phology. Its main aim is to shed light on the identification of the se- mantic primitives underlying the most prominent viewpoint aspectual forms referred to in the literature (e.g., Imperfect, Perfective, Perfect, and Neutral), and to give a principled explanation of the way in which these semantic primitives are represented in the syntax and mapped onto the morphology. The introduction surveys and com- pares the different proposals that the authors in the issue defend in this regard and discusses the need of finer grained analyses so that more accurate crosslinguistic cor- respondences, which are crucial for answering questions in realms such as that of second language acquisition, can be established. 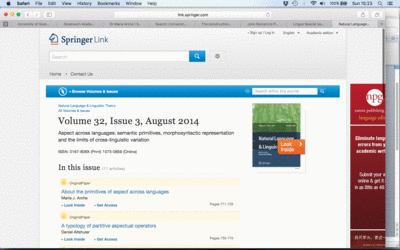 Dr. Maria Arche is the guest editor of Natural Language & Linguistic Theory journal, vol. 32, iss. 3, published in August 2014.